Grown by John Clarke who founded the orchards of the Ashdown & General Land Company during the 1930s. His son Rory Clarke remembers how his father grew it from the pip of a bright red McIntosh apple that he had eaten. The original tree grew in the kitchen garden at his home. The Ashdown Seedling apple becomes flushed red and has a light, sweet taste, though Rory Clarke describes it as sometimes sour. 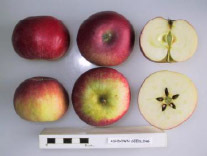 The Ashdown Seedling is an early apple that ripens in mid to late August and stores till early September. The Ashdown Seedling is a moderately vigorous tree.